Ask fellow campers about "Newberry Mountain RV and Motel Park" and nearby attractions. We only stayed one night. To avoid the fee to use our credit card, we paid cash. Their website states their sites are 50’ long by 40’ wide. Our 5th wheel is 43’ long with the tool box mounted on the back. The sites wasn’t quite long enough. I’d say the site we were in was only 40’ long. We were able to park our truck to it because of the wide width. We didn’t use any of the amenities. Would stay here again if we couldn’t find anywhere else with longer sites. 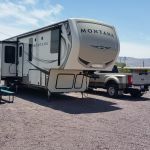 We camped at Newberry Mountain RV and Motel Park in a Fifth Wheel. looks like someone is fixing this place up. Great overnight stop. The pull thur's are pretty short. I have a 42' with a tow. Could have left car attached but I just thought it would make it difficult for someone else so I took it off. No big deal. All gravel but new and clean looking. There might have been motel rooms back in the day but no more. wifi was usable but slow. 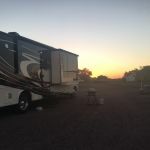 We camped at Newberry Mountain RV and Motel Park in a Motorhome. This park is a small site located next to Hwy. 40 and near major rail lines. Access to the park is easy from either direction and check in is easy thanks to the courteous staff. The site is gravel everywhere which in this case works great to keep down the dust on site. The night we where there the wind blew so hard the traffic noise etc. was not noticeable., The sites are large and the services well located. It appears the ponds and pool are as advertised but we didn't use them. WIFI is a bit hit and miss depending on which site you are in and the units between you and the office. This park is good value for a night when passing through. We will stay again. 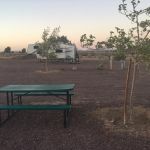 We camped at Newberry Mountain RV and Motel Park in a Travel Trailer. Good place to stop along I-40 near Barstow, CA. Sits between old Rt. 66 and I-40. Large flat gravel lot - pull thrus and back-ins. Two large ponds. Nice manager. We bought propane here. 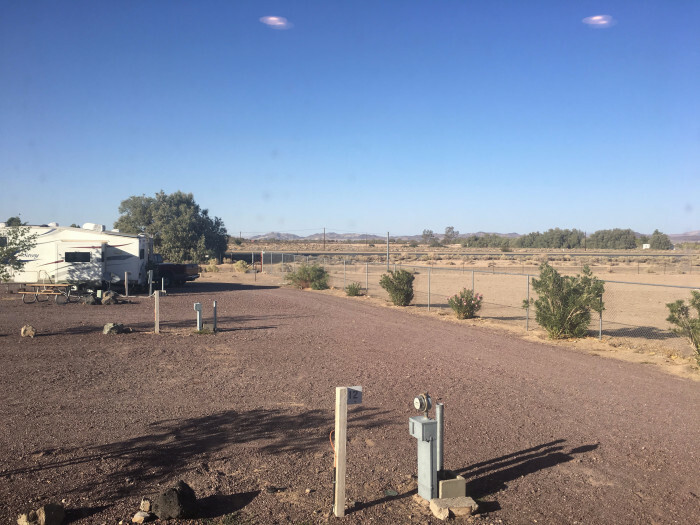 We camped at Newberry Mountain RV and Motel Park in a Motorhome. Gravel lot off the Interstate, smooth area, so road noise wasn't an issue, felt pretty good, able to sit out and enjoy the dark sky. Watched some bats flying around at dusk. Handy on and off the freeway. 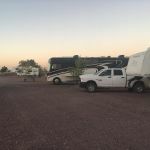 We camped at Newberry Mountain RV and Motel Park in a Motorhome. This was a very convenient stop off the I-40 and Route 66. It was fine for a 1 night stay. The I-40 traffic noise was constant and could be heard inside our motorhome. It was 100 degrees and the electric was reliable. The lady in the office just had twins and was super sweet and helpful. The person beside us was a long-term travel trailer (didn't look junky), but woke us up at 4am. We thought someone was robbing us because of all the noise. The neighbor was so close that their repeated door slamming sounded like someone going into our basement bins. We actually got up to check what was going on. They were excessively noisy at 4am slamming doors, running their vehicle, talking really loud, etc. The person on the other side of us was a rental RV and they had 5 dogs all off-leash. The dogs charged our RV when we tried to exit our motorhome with our dog. So, our experience there wasn't great. The grounds are fine. Everything appeared clean. The little lake in the middle and the palm trees were a nice touch. The pool looked clean, although we didn't use it. I would stay here again (and hopefully have better neighbors) if we needed a stop in this area again. 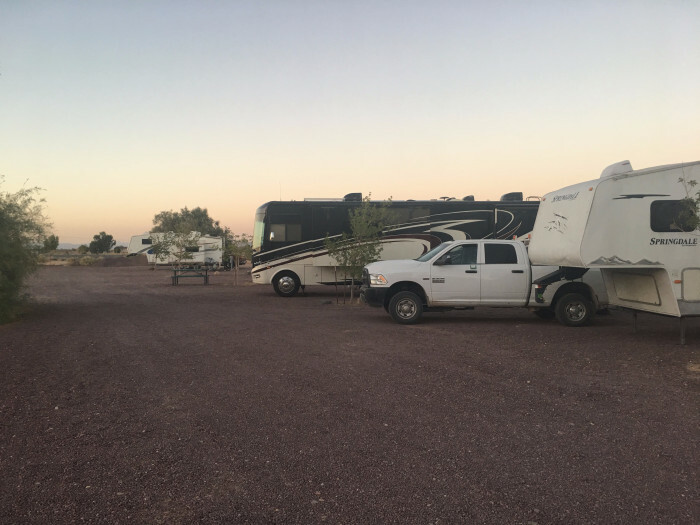 We camped at Newberry Mountain RV and Motel Park in a Motorhome. The young lady at the office was very nice and expecting twins! Easy check in. Nice little pool which felt wonderful in the 100 deg heat. It's a desert campground with adequate gravel. New picnic tables. Duck pond. A few palm trees. Not exactly an oasis but very adequate for the night. Would definitely stay here again. You could tell they were proud of their little campground. Sites were a little short for bigger rigs but not too much of a problem. Wifi works OK. We camped at Newberry Mountain RV and Motel Park in a Travel Trailer. There's nothing here but it's a good spot for the night. Clean grounds. Nothing Fancy. Clean Gravel everywhere. Pool. Felt safe. Perfectly adequate for over night. 50amp for that price is good. Happy to stay again. 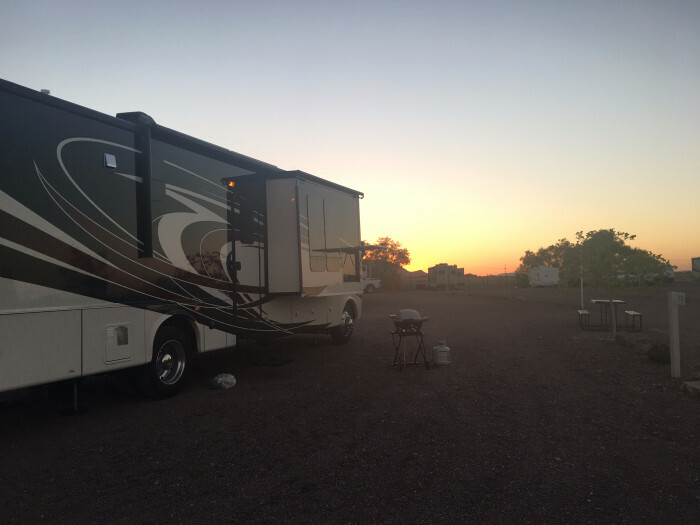 We camped at Newberry Mountain RV and Motel Park in a Motorhome. Nothing close to site see...just a decent place to overnight with 50amp in a hot climate. This is an older park with easy on/off access to I-40. You can see and hear the freeway, but the noise wasn't too bad inside the rig. 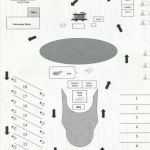 There are 18 FHU spaces, 9 of which were back-in (but were full with long-term/permanents) and 9 pull through sites. There are also 4 dry camping spaces, tent spaces and 4 small motel rooms. 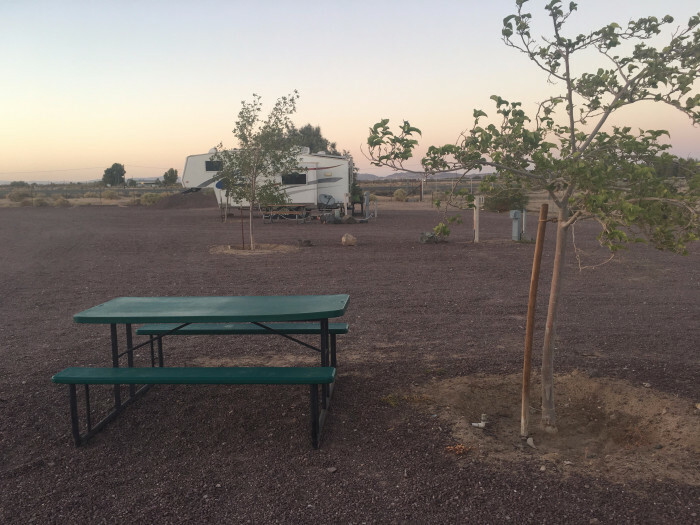 We stayed in site 18, a pull through site with a picnic table. Interior roads and sites are comprised of gravel/rock, but the sites are quite short so your rig will stick out into the exit road of the park. This wasn't an issue for anyone that we saw leaving the park though. Hookups are all at the rear of the sites and we had to use 3 sewer hoses to reach. Water pressure was on the low side at 30 psi. 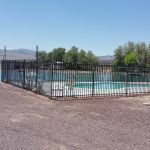 They have two ponds on site that you can fish in, and a small but clean swimming pool. There are 2 individual bathroom/showers (one for men and one for women), which were dated but clean. The office gave us codes to the bathrooms, but I guess the code locks aren't functioning as we never had to punch them in. There were no paper towels in either bathroom to dry your hands for the 3 days we were there. The park also has laundry, propane refills on site and a rec room. 13 cable channels were included in the price as well as free Wifi (we didn't use it). Verizon signal was very good. The area around the park is fairly desolate if somewhat depressing. The park is slightly above average and is certainly not a destination but rather, a convenient one night stop when passing through. We would stay here again. Rate is with Escapees discount. 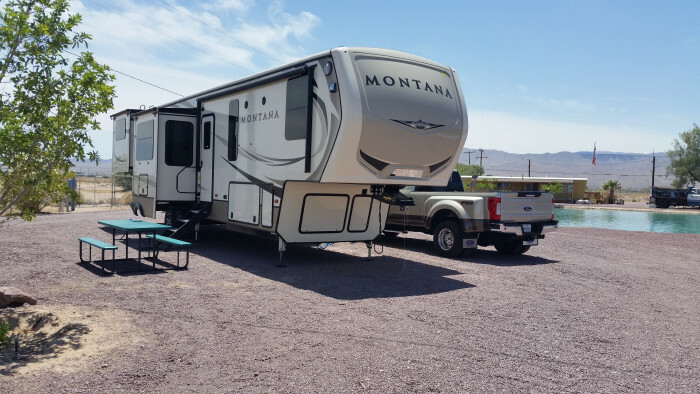 We camped at Newberry Mountain RV and Motel Park in a Fifth Wheel. There's not much around the area to do. There is a Mobil station close by with gas, food and other conveniences. There is also a Subway not far away. We drove 23 miles into Barstow to buy groceries at Walmart and fill up with diesel (the gas stations closest to the park are very expensive). Nothing fancy here. Basic, clean, level, 50 amp, everything you need very close to I-40. The thing that makes it work are the two turquoise ponds with ducks, geese and other birds. We saw 2 families of ducklings, many other birds, and enjoyed the movement of the water. The pull-thrus seem too short, but everybody makes them work--I saw a big rig with a toad completely blocking the road, but the office staff made it work, so nobody had a problem. 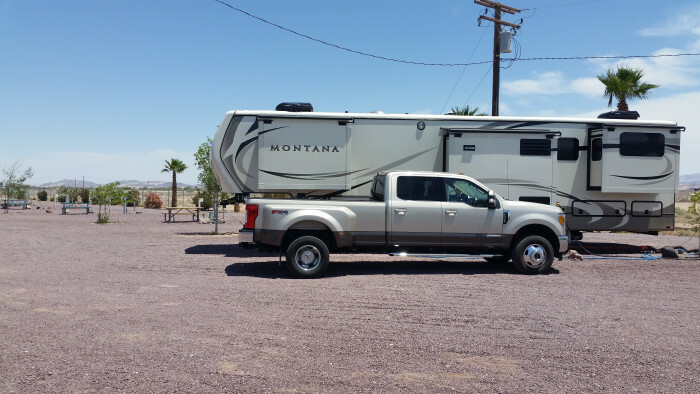 We camped at Newberry Mountain RV and Motel Park in a Fifth Wheel. The Mobil station at the freeway entrance has several out-of-order diesel pumps that are not marked. We spent some time trying to find a working pump that wasn't already occupied by 18-wheelers before giving up and moving to the next exit, where the new Mobil station was charging 70 cents a gallon more than the station around the corner. Plus most of their pumps were out of order. Too new, perhaps? No excuse for their prices, tho. Stayed only one night in 30 amp site. They are moderizing putting everything on the computer. Nice easy stop over for our journey to Arizona. 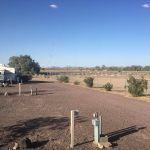 We camped at Newberry Mountain RV and Motel Park in a Motorhome. Great stop over between Cental Coast and Lake Havasu. 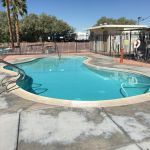 We have stayed here twice--once in the hot, hot, summer and we were so grateful for the pool to cool off! The last time was in November, so the temperature more comfortable and we didn't use the pool. There is a big pond with ducks. Some road noise from I-40 but it didn't keep us awake. Extremely friendly woman that runs the place, very helpful. Some long term folks, not an issue. It is a great stop for us when traveling from AZ to CA. Would stay again. 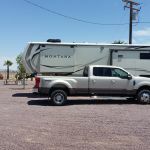 We camped at Newberry Mountain RV and Motel Park in a Motorhome. Easy on/off, approximately 1 1/2 miles south of I-40 (paved county road a little rough but navigable). Owners very friendly and eager to please. Site was clean and well-organized. A nice layover location and, if you're going West over Tehachapi Pass, it's close enough that you can time your drive to get over the Pass during midday. (Have never liked making that trip after dark). 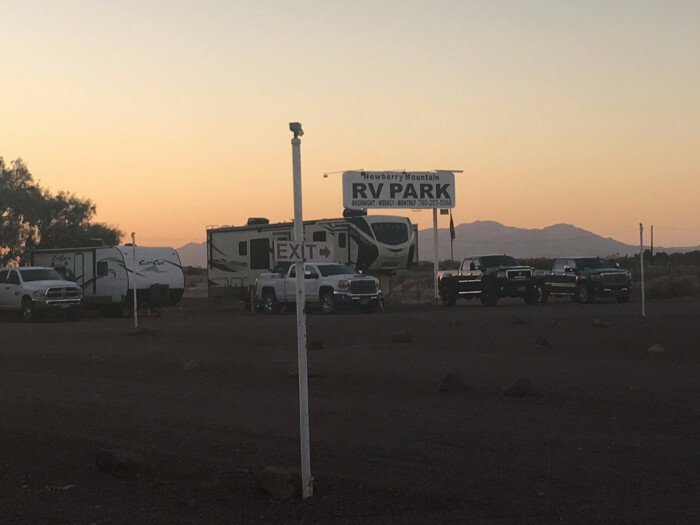 We camped at Newberry Mountain RV and Motel Park in a Motorhome. Not much close by. A small convenience store at the I-40 exit but if you anticipate needing groceries, etc., recommend you get them earlier. An older park thar has been kept up well. Some traffic noise but turning on the a/c fan covered it all up. This is a good overnight stop, close to exit 23 on I-40. GPS may want you to get off elsewhere. We will stay here again when traveling through. 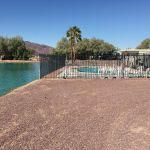 We camped at Newberry Mountain RV and Motel Park in a Motorhome. We only stoped for the night. 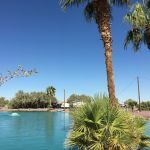 Given that this park is in the desert, and is the best park to stay in that has full hook-ups if you want to visit the Mojave Desert, it is a great stop! 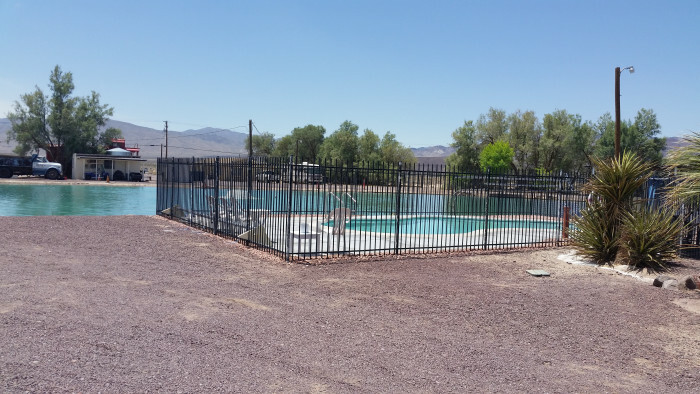 The lady who checks you in is very nice and encourages you to use their nice pool, the utilities are all in good shape (compared to the last park we were in with horrible water pressure and electric that kept cutting out) and it is right off I-40. We would come here again. 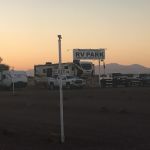 We camped at Newberry Mountain RV and Motel Park in a Motorhome. Up the road is the Baghdad cafe, featured in movies. While I was there a tour bus pulled up with european tourists looking at the sights on Rte 66. Are you affiliated with Newberry Mountain RV and Motel Park ?